Over the next two years, he expects Sensex to reach upto the 35,000 - 40,000 levels - that's at least a 45% upside from current levels. On a two year basis, his risk - reward assessment is therefore -7% vs 45%. 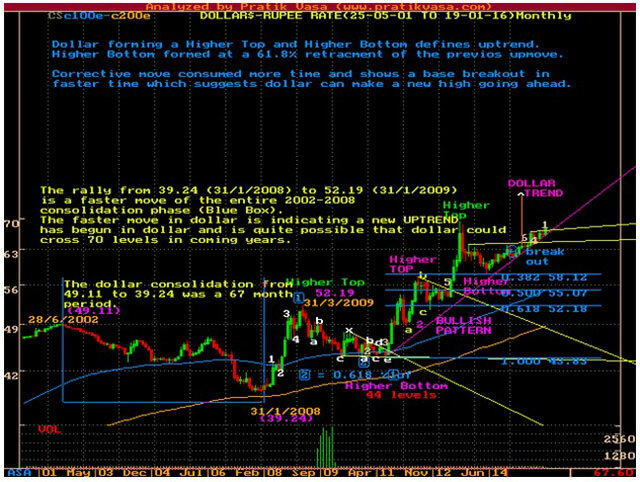 Pratik believes the US dollar's bull run - which he had correctly forecast back in 2013 in his WF article - is now close to completion, and that the dollar can go into consolidation mode after reaching its target of Rs.70. That he believes, will provide relief to oil and will support our market. 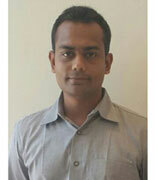 The rural economy is where Pratik believes you must focus your attention. Technically, fundamentally and from a prospective news flow point of view, that's where the action is likely to be. The fact that it is a beaten down segment today is an added attraction. PSU banks and Capital Goods perhaps may be good trading bets now, but do not appear to be sound long term investment bets, in his opinion. He believes one should continue to stay away from gold, perhaps for the next couple of years. BSE SENSEX had made a top at 30,000 levels in March. Since then it's been in downtrend making lower top and lower bottom. In the past such corrections have consumed 13 to 14 months. 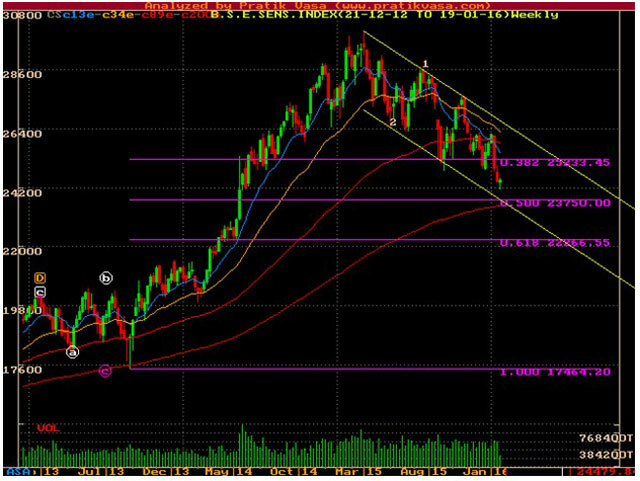 We are now in the 10th month of the downtrend and the Sensex with today's fall is very near to the lower support line of the downtrend channel. Such support lines offer good buying opportunities. Though we need to wait for some reversal signs on Sensex, stock specific bottoming out should be seen first. In the worst case Sensex can retrace up to 61.8% of the previous rally which comes to 22,300 levels. In other words, a maximum downside of around 7% from these levels of 24,000 is our worst case. Sensex should see good upward momentum towards the end of 2016. Over the next 24 months, one can expect an upside target for the Sensex in the region of 35,000 - 40,000 (that's at least 45% up from the current level of 24,000). Since long I was bullish on Dollar and we are very close to the target of 70 that I have spoken about in my earlier articles in Wealth Forum. In 2016, once dollar makes a new high, it should go for consolidation, which should support Indian Markets. Oil has broken all supports on its way down. $26 is a major support now. When the dollar tops around the 70 levels, that would provide relief to oil prices which can then form a base. In my opinion, gold is best avoided for at least another 2 years. In my view, the best theme to buy into now is the rural consumption and rural economy theme. Several stocks in rural finance, farm engineering equipment, retail, consumer durables, auto, cement, pharma - which have sizeable exposure to the rural economy - are looking promising. In addition to what the charts say, this theme is also a contrarian call in a beaten down segment of the market. Two years of bad monsoons have negatively impacted the rural economy and also the companies that serve this segment. With the prospects of a La Nina this year rather than the dreaded El Nino, monsoon should be good. If the Government extends Budget support to the rural economy as expected, that will be another key driver. I would put this as the next in line, after the rural theme. Most of the sectors mentioned above also serve the urban markets. In addition to these, private banks, auto, auto ancillaries and the logistics sectors look attractive. I think PSU Banks may not be attractive from a long term investment point of view. There can be a short term bounce now - but that is more of a trading strategy than an investment call. Likewise, Capital Goods does not yet look like a good investment bet. In the engineering space, there are a few midcap stocks that have largely gone sideways for several years now - these could present good investment opportunities once we see more action on the capex front. It looks like a good time to invest with a two-year perspective. Risk-reward from a two year perspective (-7% vs 45%) is in favour of investing now. US dollar going into a consolidation mode will provide relief to oil and to our market. As I have been saying since 2013 on Wealth Forum, focus more on stocks and sectors than on the Sensex - that is where all the action is, and is going to continue to be.